Preheat oven to 425 degrees. In a small bowl, combine butter, scallion, garlic, paprika, cumin, coriander, cayenne, parsley, cilantro and 1/2 teaspoon salt. Form into a log, wrap with plastic wrap and chill in the freezer for 15 minutes. Cut the log in half and store one half for another use. Cut the other half in half again. Gently separate--but do not remove--the skin from the chicken. Stuff a butter round under the skin of each breast and press down to slightly distribute it. Place in a baking dish, drizzle with olive oil and season with the remaining salt. Bake for 15 minutes, reduce heat to 350 degrees and continue baking another 30 to 40 minutes or until a thermometer registers 165 degrees. Baste chicken with the pan juices twice during roasting. Meanwhile, heat oil in a saute pan over medium-high heat. Add the carrot and red bell pepper and cook 3 to 4 minutes. Add the scallion and zucchini and cook another 3 to 4 minutes. Add the garlic, coriander, turmeric, cayenne and saute briefly. Add chicken broth, salt and pepper and raisins. Bring to a boil. Remove from heat, stir in couscous, cover and let stand 5 to 6 minutes. Fluff with a fork, cover and keep warm. Just before serving, add almonds and parsley. 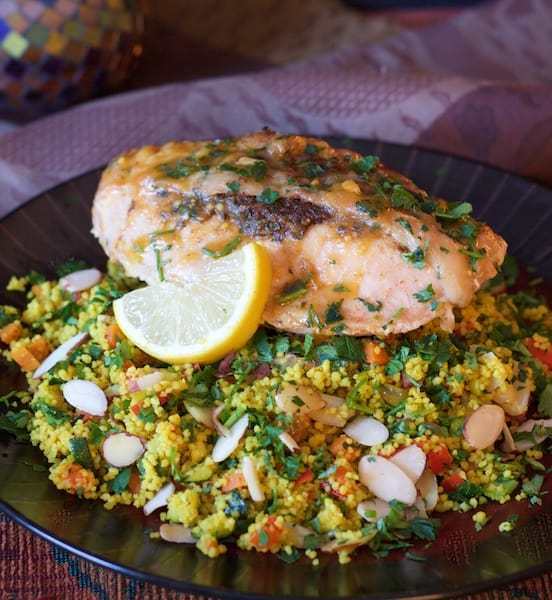 To serve, spread couscous on a platter, top with chicken and drizzle with pan juices. Serve with lemon wedges.